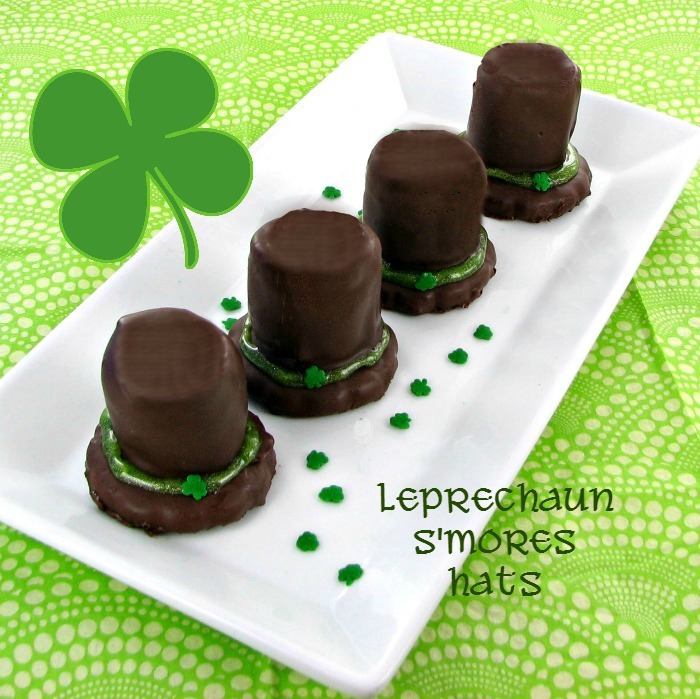 Leprechaun Hats – S’Mores Style! I love fun and easy holiday recipes that tell the story of the celebration by the look of the sweet treat. Desserts like this set the mood for a party and are so whimsical. 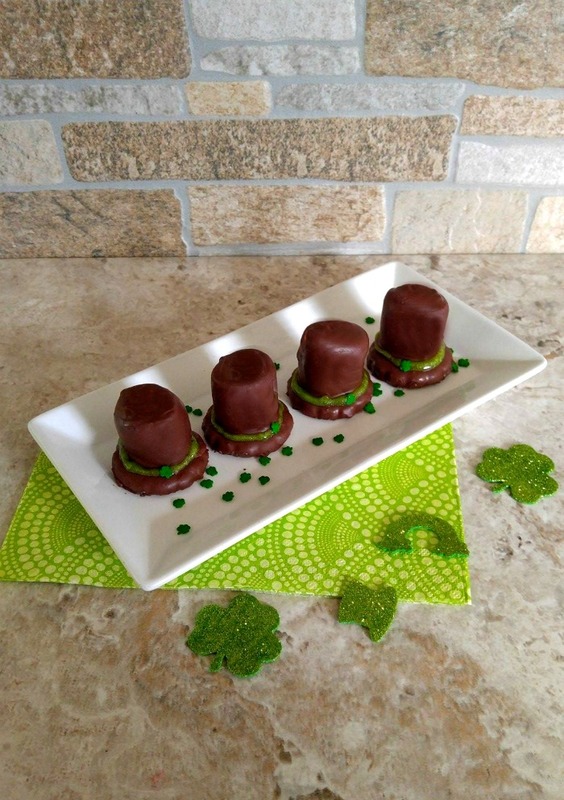 It’s time for some luck of the Irish with these adorable Leprechaun Hats made with chocolate and marshmallow. It’s almost like having s’mores the Irish way. :It’s fun to make holiday themed food for St. Patrick’s day. It’s a great way to set the mood. Try these Bailey’s Irish Cream Truffles for another tasty holiday dessert. To make the Leprechaun Hats you will these supplies. Start by making a dipping station with your supplies. I like to make a sort of production line when I make treats like this. It makes the whole process go much more quickly. Melt the chocolate and coconut oil in the microwave by heating for 30 second intervals and stirring until it is silky smooth. It’s time to dip the Marshmallows! 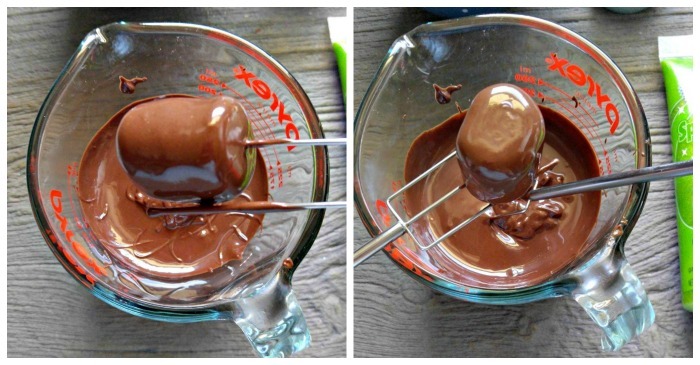 Dip each marshmallow into the melted chocolate. I use a candy tipping tool set. The prongs of the forks nice and sharp and the three pronged tool makes a great place to rest the marshmallow while the chocolate drips off.. Tap off the excess chocolate and place the hats on a silicone baking mat to set. The hats are basically made in two steps. The hat tops get dipped first, and then thinned down the chocolate that was left over is used to dip the Girl Scout thin mints. This makes the two parts of the hats the same color. 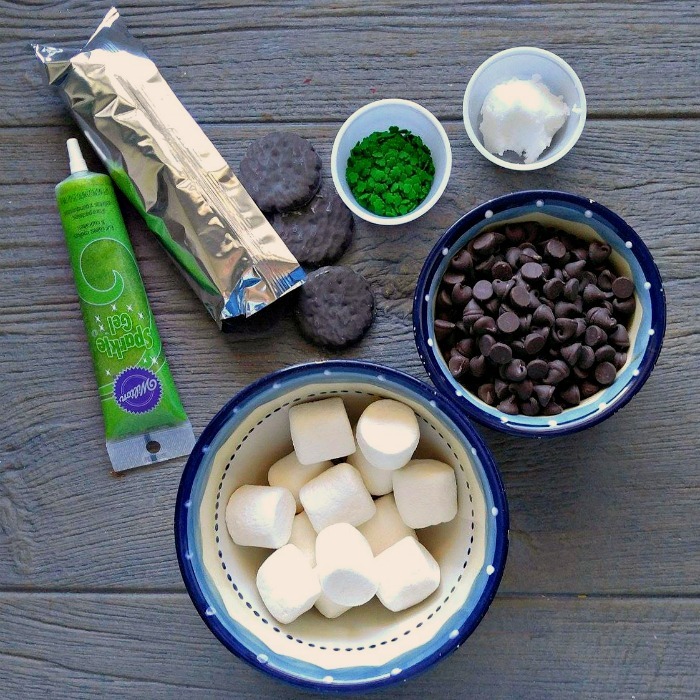 Once the marshmallows are set, use a bit of the melted chocolate to join them to the thin mints to make the hat shapes and then use the green sparkle gel icing to add a hat band to the hats. The hat band gets decoratefd with a mini shamrock sprinkle while the icing is still soft. Time to bite into one of these sweet treats. Mm Mm S’mores Leprechaun Hats! That is all there is to these adorable Leprechaun Hats. May the luck of the Irish be with you while you sample one (or four!) of them. For more fun St. Paddy’s Day ideas, be sure to visit my St. Patrick’s Day board on Pinterest. If you would like to do this project, you can print it out below. Leprechaun Hats - S'Mores Style! 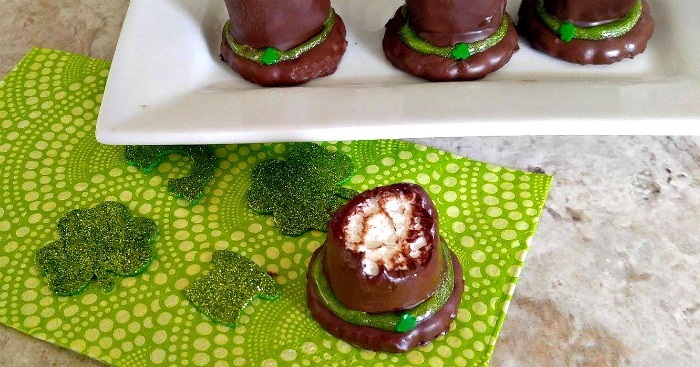 It’s time for some luck of the Irish with these adorable Leprechaun Hats made with chocolate and marshmallow. It’s almost like having s’mores the Irish way. Melt the semi sweet chocolate with 1 tbsp of coconut oil in the microwave, in 30 second intervals stirring often until the chocolate is melted and silky smooth. 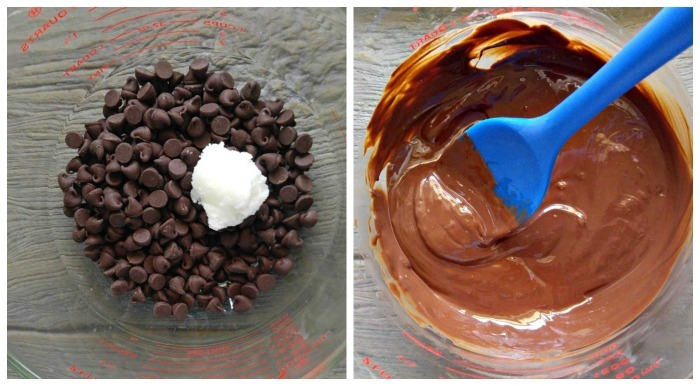 Dip each marshmallow into the melted chocolate and coat it thoroughly. Tap the tool to shake off any excess. 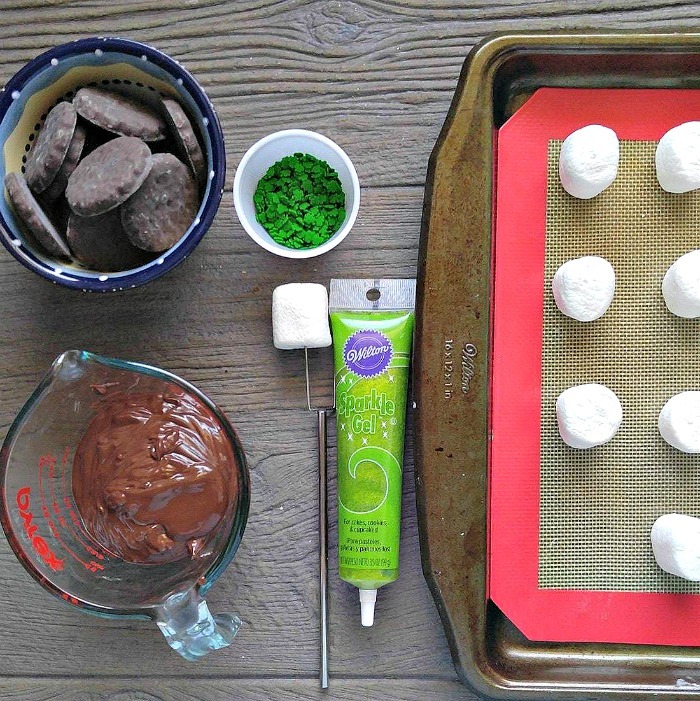 Set the coated marshmallow on a baking mat until the chocolate is completely set. 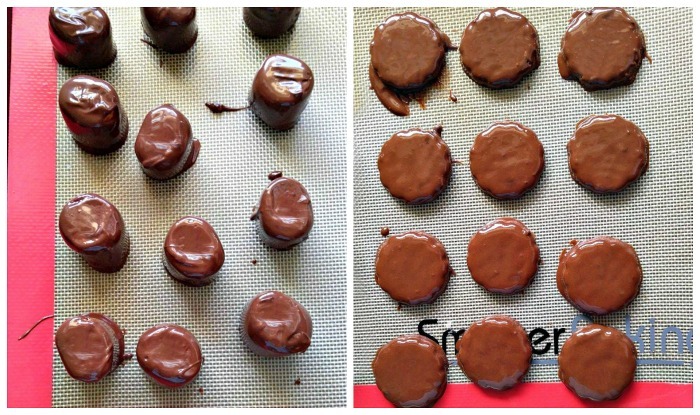 Thin down the left over chocolate with 1-2 tsp of coconut oil and dip the girl scout cookies so the chocolate color matches. Let them set completely. 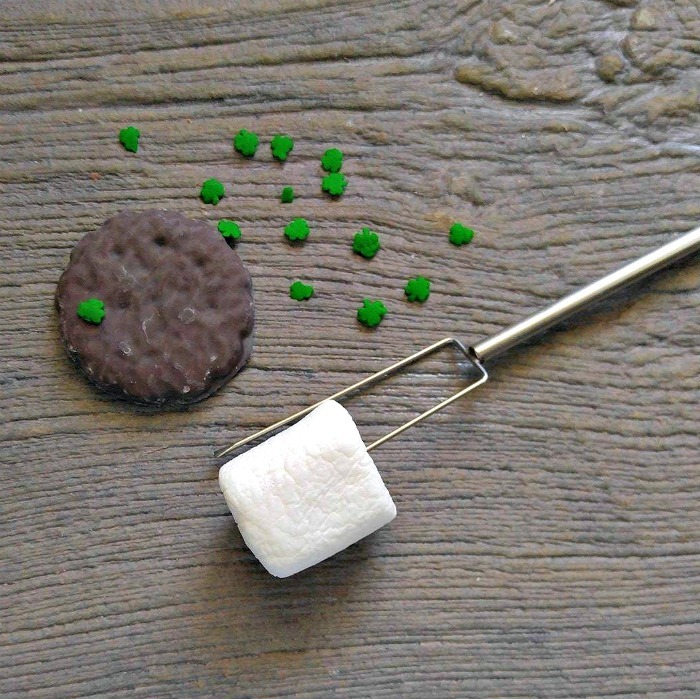 Add a bit of the melted chocolate in the middle of the Girl Scout cookie and attach the marshmallow so the two form a hat shape. Once the hat has set, use the green sparkle gel to make a rim around the joint as a hat band. 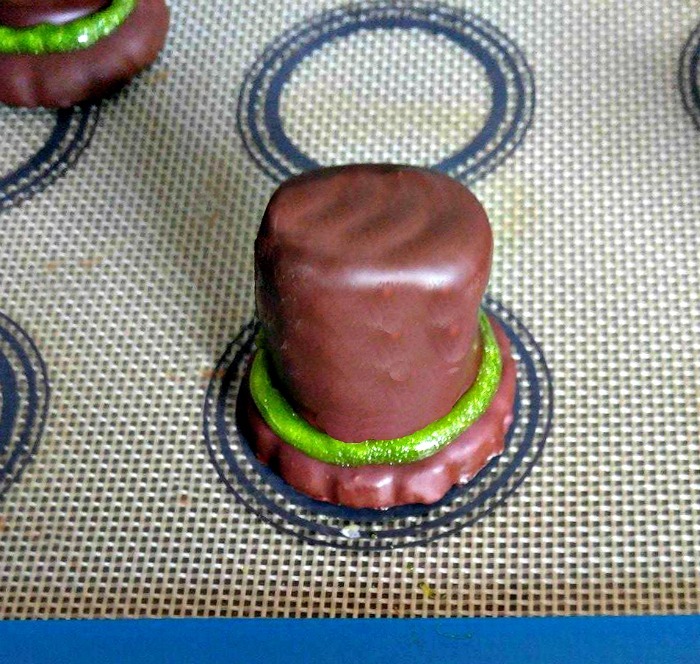 Add a mini shamrock to decorate the hat brim while the icing is still soft. This cute sweet treat is inspired by one that I first saw on The Cake Blog.